Several local churches will be taking part in Good Seed Sunday April 23 with A Rocha Canada. The Christian conservation organization is sponsoring a “time for Christians across Canada to honour the Creator as they celebrate and care for creation” on the Sunday following Earth Day. Caring for creation is not a passing trend or political card to be played, but rather central to the biblical story and integral to our Christian faith. As followers of Christ at Tenth Church, we want to be people that lead the way in caring for God’s good world. 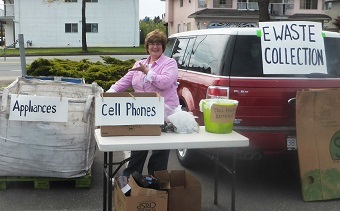 Emmanuel Mennonite Church holds an annual e-waste recycling Sunday. Emmanuel’s Green Team focuses on raising awareness related to creation care and greening our church and homes in a variety of ways. So we have buckets in our church foyer for recycling batteries and compact fluorescent light bulbs; after church meals we collect organic waste for composting; we’ve begun a community garden; we hold an e-waste recycling Sunday once a year, and plan to add recycling Styrofoam as well.
. . . a thought-provoking exploration on bullying and violence between young girls. In this one-woman show, 15 year old Braidie recounts the bullying she has seen within her own friend group from childhood through to adolescence. . . . The Shape of a Girl by Joan MacLeod is an important reminder of the scary progression of bullying, the long-lasting damages it can cause, and how doing nothing contributes to the circle of violence. In 1997, Reena Virk was murdered in Victoria at the age of 14. She was lured to a party where she was swarmed and beaten by a group of her peers. She was then followed by two of them and murdered. Seven of the eight charged with aggravated assault or second degree murder were females. 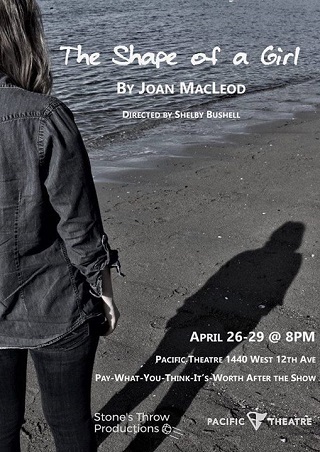 Stone’s Throw Productions operates under the aegis of Pacific Theatre, offering non-professional community members opportunities to work alongside theatre professionals in its community shows. Tickets at the door – pay-what-you-think-it’s-worth after the show. 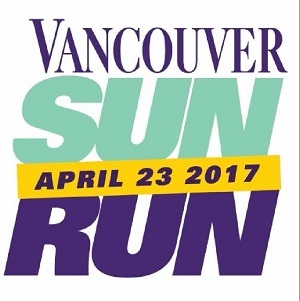 People have been known to skip church in order to take part in the Vancouver Sun Run, so it is good to see that Christ Church Cathedral is offering Godspeed: The Sun Run Service, this Sunday (April 23) at 8 am. Spiritually prepare for the race with music, readings from scripture and inspirational preaching. All are welcome! Register early, get your number and come on in to Christ Church Cathedral – located right on the starting line! Doors open at 7:30 am. Village Church only started in 2010, but it is already one of the largest churches in Canada, with several thousand people in eight services at three locations, two in Surrey and one in Langley. 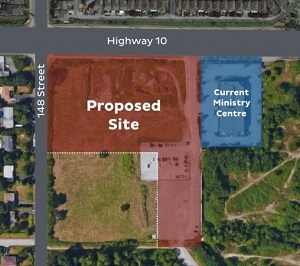 The church has not had a permanent location, but now has bought property at 148 Street and Highway 10, and is hoping Surrey City Council will permit rezoning to allow them to build a permanent structure. Go here for an overview. Matt Eisenbrandt, the Vancouver-based author of Assassination of a Saint – a new book about the men who killed Archbishop Oscar Romero while he celebrated mass 37 years ago – says the subject is still dangerous to talk about. Eisenbrandt is now legal director of the Canadian Centre for International Justice. Go here for the B.C. Catholic story. The Franciscan Friars of the Atonement are leaving BC after more than 80 years, due to dwindling numbers. The news comes just ahead of a significant milestone for the thriving parish they developed (2,800 families registered). In June, St. Joseph the Worker Catholic Church in Richmond will celebrate 50 years since the friars built their current church structure. Two churches have completed brand new kitchens so they can serve their surrounding communities better: North Shore Alliance Church and St. Timothy’s Anglican Church in Burnaby.